December 17: Joseph Henry, LL.D. Consider how he was described by his contemporaries and historians in general. He was a reserved quiet man, with great gentleness, courtesy of manner, reserved, and an unselfish genius. We could add that he was a Christian. And we could add a Presbyterian. 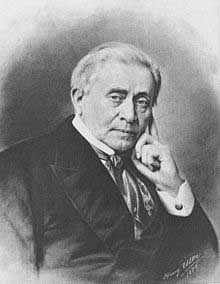 Joseph Henry was the foremost scientist of the nineteenth century. Born on December 17, 1799 in Albany, New York, he came from a poor family background. He was able through generous friends to attend an academy, but essentially most of his education was self-taught. But what a personal education. Through reading of text books in the scientific field, he was able to make contributions in the fields of electricity, electromagnetism, meteorology, acoustics, as well as in several branches in physics. Soon, he knew more than his instructors did, and he wound up teaching their classes in the academy in New York. Princeton University asked him to come there and teach, though he had no educational degrees to speak of, which would add to the lustre of the academic status of the school. But his scientific mind and his accomplishments were a considerable substitute for that intellectual learning. Joseph Henry went to meet his Lord on May 13, 1878, with his funeral three days later at the New York Avenue Presbyterian Church, of Washington, D.C., where he had been a member. On this solemn occasion, the President of the nation, Rutherford Hayes, was in attendance, as were the Vice President, the Chief Justice of the Supreme Court, members of the cabinet, with leading officials of every branch of the government, with representatives in science, literature, diplomacy, professional, and business life in America. Words to live by: People can be recognized by the world, and that has its place. But better than that is to be recognized by the Savior of mankind, as a spiritual child, a brother in Christ, and an adoptee into God’s forever family. The former may be remembered by the world for a time. The latter is remembered for time and eternity. For which one will you, dear reader, be remembered?